Time changes to and from daylight savings time is something we deal with every year. It effects Billy Ray and even his service dog, Penny Lane, every time. Both are very routine oriented. Going to bed is the internal time clock not the one on the wall. If this is an issue for your child, you can try adjusting little things such as dinner time, chores, etc. in tiny increments leading up to the actual time change. It helps to get modification of routine started rather than immediate change. We got caught offguard this year and didn’t begin modifying his schedule like I normally would. Billy Ray is going through some life changes relative to changes in his chemistry from medications he took for Acid Relfex but doesn’t need since surgery to repair the Acid Reflex, substantially reduced appetite (so we are doing lots of tiny meals) and difference in energy level. Before our recent time change he was already wanting to go to sleep much earlier than normal. I think that it is because he is eating less since surgery and he runs out of energy earlier in the day. If he does that, he will be up for the day by 2-4 a.m. besides the usual short periods of waking up during his sleep. It takes longer to adjust since we didn’t prepare for it this time. As in everything the need to anticipate, adapt and communicate applies to time changes. I don’t remember if I posted this picture before or not. It was snapped about a year ago when Billy Ray had gotten up and dressed, done his daily marching routine and was tired. He crawled back in bed and Penny Lane joined him. He then covered her up for a nap together. Oh I'm glad it's not just us. Mine usually get up at 6[ish] now they're up at 5. I follow your blog. I have a seven month old little girl. She has many many issues. To the extent we are not sure, we are to assume she will be severly mentally challenged. You are a very positive role model to follow. 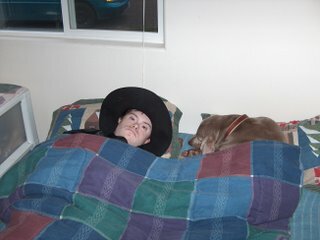 I enjoy seeing Billy Ray sleeping with his dog. We are about to get a dog for Adam (who is very sleepy today btw). I like the photo of Billy Ray and his dog. Matthew starts a week or so before the time change in waking up really early. Once we change the clocks he is okay since he goes to bed by 7 pm and the meds help. Peggy Lou, where ARE you??? it has been too long since you posted.